Last Tuesday, July 17, I attended the forum, "The Economics of Biotech products" held at SEARCA, UP Los Banos, Laguna. The Philippine Economic Society (PES) was a co-sponsor of the event. PES also provided the free transportation for participants from Manila to UPLB and back. 2 Comments, from Dr. Ramon Clarete of UPSE and Dr. Marites Tionco, Dean, Economics Department, DLSU. The more substantial and interesting paper for me that day was the one from Dr. Aldemita of International Service for the Acquisition of Agri-biotech Applications (ISAAA). Like this slide. During the open forum, I asked her two questions. 1. 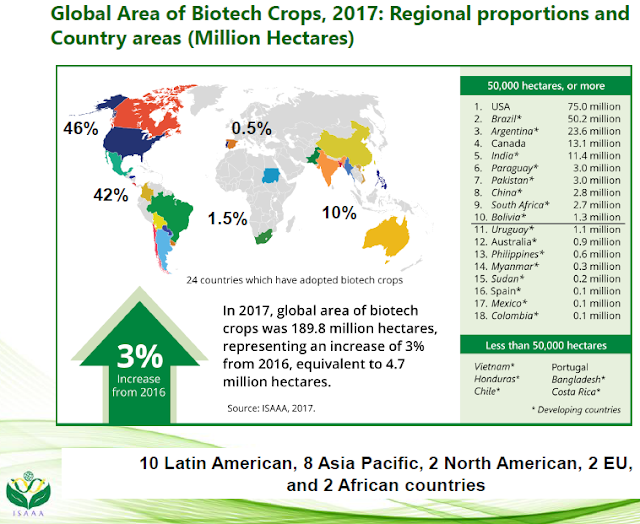 EU countries being non-friendly to biotech farming and Greenpeace is among the bad guys in opposing genetic modification (GM) and biotech farming in developing countries like the PH, do you see or read stories like EU countries funding GPeace and other anti-GM activists? 2. You mentioned "decarbonisation" to fight climate change in your presentation but agriculturists know that CO2 is a useful gas to humans and plants, it is not an evil-pollutant gas as claimed by the UN and Al Gore. More CO2 means more plant growth, more food production, so don't you think it is time for agriculturists to push back and stop demonizing CO2? Her response to #1 is No, and EU countries are not really anti-GM, they are among the big importers of the US' soybeans and other GM crops. On #2, she said that too much CO2 can be dangerous to the planet. Oh well, from other modern agri lectures that I attended, like Israeli agri-business forum in Makati a few years ago, they use CO2 injectors inside greenhouse farms and raise the CO2 level from 400 ppm (global level) to 600 ppm, even 800 ppm depending on crops. Higher CO2 results in faster growth, shorter harvest period for crops and hence, bigger income for farmers. Anyway, it was a good forum, thanks PES, thanks Majah and team, thanks SEARCA.